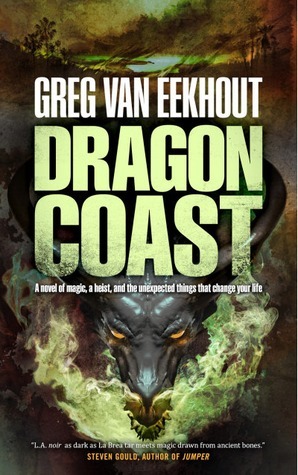 With his trilogy about a darkly magical California — California Bones, Pacific Fire, and Dragon Coast — Greg van Eekhout has created an interesting world that puts wizards and fantastic creatures into a roughly contemporary setting and spun exciting stories of adventure among the people who shape that world. Earth is home to many magical creatures, from the kraken of the depths through the mammoths and sabretooth tigers on land to dragons in the air, all the way to the great beast at the heart of the world. Some trained humans gain access to these creatures’ power and other kinds of magic by eating their flesh and bones. They take the beasts into their beings and become magical themselves. That also makes them vulnerable, because any sorcerer who consumes their body will likewise gain the power of every beast they have absorbed. It’s a harsh society that calls California’s mild climate home. The first followed Daniel Blackland as he upended the magical order in southern California; the second followed Daniel and his ward Sam, a golem of potentially immense power as they try to stop the creation of a Pacific firedrake, a massive dragon stronger than anything else known on the whole of the coast. Discussing the plot of Dragon Coast is impossible without revealing the ending of Pacific Fire. Pacific Fire ends in apparent failure, as neither Sam nor Daniel can foil the firedrake’s makers. In the closing scenes, readers discover that Daniel has misunderstood the process all along, and that his efforts will not prevent the firedrake from coming to life but will only result in it being completely out of control. At the last moment, Sam plunges into the tank containing the firedrake, apparently sacrificing himself in an attempt to magically merge with the dragon and provide some sort of brake on its destructive nature. Dragon Coast begins from Sam’s point of view. His consciousness is still intact, and he is somehow inside of the dragon. At times, he is able to guide it, via a cockpit that could be an actual part of the constructed beast, or could be a metaphor constructed by his disembodied self. But he cannot control the dragon reliably, and what the dragon most wants to do is wreak havoc, burning settlements up and down the coast of southern California, and neighborhoods within Los Angeles. Inside the dragon, Sam finds the consciousness of Annabel Stokes, another magician, someone the Hierarch had consumed long ago. Outside the dragon, the action continues directly from end of Pacific Fire. Daniel has realized that Sam is not gone, and hatches a plan to draw his consciousness out of the dragon with a piece of axis mundi and send it to a new golem. Gabriel Argent, the would-be triumvir of Los Angeles who secretly worked to sabotage the dragon project, wants to control it now that it is indisputably out in the world. Daniel and Gabriel form an alliance because both of them need to draw down the firedrake and approach it in the closest thing it has to a vulnerable moment. Neither fully trusts the other, and with good reason; ultimately, they are working at cross-purposes. The bulk of the novel takes place in northern California, a realm only alluded to in the two previous books. It is hostile to southern California, and the border between the two is closely guarded. Daniel ventures into the heart of the north after he loses the first piece of axis mundi that he manages to steal. The northern Hierarch has a much larger piece embedded in her crown jewels. Getting it will be Daniel’s most dangerous heist ever, all the more so because his mother may still be in the Hierarch’s secret service. This heist explains an event at the end of Pacific Fire that felt out of place: Daniel killing his semi-brother Paul within minutes of meeting him at the climax of the second book. Paul was a golem that Daniel’s mother used to throw off pursuers when she crossed back into northern California many years before. Daniel was told that Paul had been shot in the head, and presumed that he died. In fact, Paul recovered and grew into one of the most formidable sorcerers in the northern polity. His sudden appearance and demise in Pacific Fire are necessary to the structure of Dragon Coast, but the event sticks out because it’s as much a surprise to readers as to Daniel. It felt to me like exposed plot machinery, rather than a natural development of the story. In Dragon Coast, Daniel has to impersonate Paul to infiltrate the northern court and try to steal the axis mundi from the Hierarch. It’s interesting to see the differences between north and south — this is van Eekhout’s take on contrasting realms, as seen in Zelazny’s Amber and many others before and since — and to follow Daniel through a fantasy setting that’s more traditional than the magic kingdom of southern California. On the other hand, he’s an impostor the whole time, so I was distanced from both the setting and his actions within it. Paul’s brief appearance left me thinking of all of the dilemmas arising from Daniel’s choice as constructed, rather than tragic. I appreciate that van Eekhout is working to deepen Daniel’s character and show him facing more difficult problems than pulling off a successful caper, but the transition never quite succeeded for me. The adventure is still there — the sections with water mage Gabriel are particularly strong, especially how he draws on unexpectedly deep power — and the supporting cast may be even better to spend time with than Daniel. Osteonmanthic California is a setting that could be home to many more exciting stories and adventures. 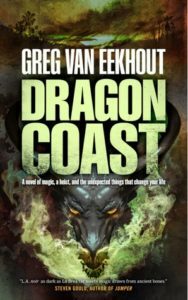 Even Dragon Coast didn’t quite work for me, I am still glad to see van Eekhout stretching to see what he and his characters can do. His current book is aimed at younger readers, which is not generally my thing, but I will keep my eyes peeled for his next adult work, whether or not it’s set in sorcerous California. Dude.